Product categories of Intermix Glass Beads, we are specialized manufacturers from China, Intermix Glass Beads, Intermix Glass Beads For Road Marking suppliers/factory, wholesale high-quality products of Road Marking Intermix Glass Beads R & D and manufacturing, we have the perfect after-sales service and technical support. Look forward to your cooperation! Reflective Intermix Glass Beads, used in road marking paint and traffic signs,is important in mantaining visibility of motorist for driving under dim light or bad weather. used in highway ,arrport runway, pavement marking line, zebra crossing in traffice road line, road marking as reflective materials. 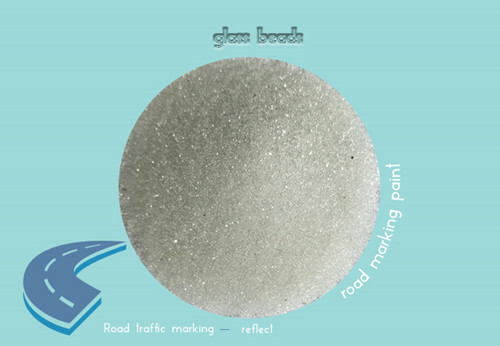 Road Marking Beads Reflective are solid, spherical glass beads for use with road marking materials such as Road and Line Marking Paint Water Based, Solvent Based and Thermoplastic. Solid glass beads for use with road marking compounds, Class A and Class B are high quality glass microspheres resulting from the specialised processing of selected glass culet. Road Marking Paint Reflective Glass Beads are a major factor in increasing road safety in an economical manner. Thanks to the beads` retro-reflective action at night, a vehicles headlight beam is returned to the drivers eye. The microspheres not only multiply the visibility of the markings at night, but also increase the markings durability in general. Road Marking Reflective Glass Beads are used as a drop agent and as premix beads for road marking materials. Increase visibility of road markings at night, High durability.